On 29 August vessels of Standing NATO Mine Countermeasures Group 1 (SNMCMG1), including the Lithuanian LNS JOTVINGIS (N42), currently led by Commander Giedrius Premeneckas (Lithuanian Navy) moored at Turku seaport in Finland. SNMCMG1 will take part in NATO-European Union's Exercise Northern Coast 2014 in the northern part of the Baltic Sea and the territorial waters of Finland, the Ministry of National Defence reports. The large-scale annual Exercise Northern Coast 2014 trains naval, air, land and special units from NATO and European Union's member states. This year the exercise is organised by the Finnish Navy and involves 50 warships of various types, 10 aircraft, and roughly 3 thousand land and special forces personnel from 14 countries. The active phase of Northern Coast 2014 on September 1-11 will follow a crisis response operation-based scenario to train multinational forces interoperability while responding to a regional crisis. Lithuania will be represented in the exercise by its patrol ship LNS DZUKAS (P12) alongside the JOTVINGIS which is fulfilling a half-year duty in SNMCMG1. 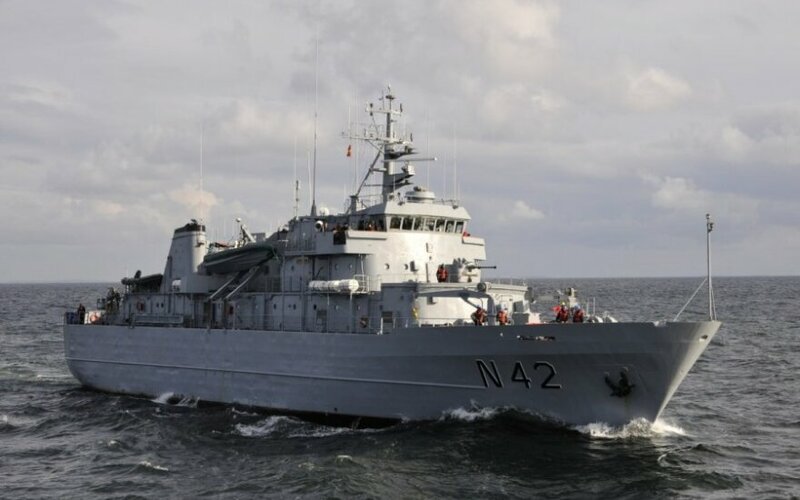 SNMCMG1 staff aboard the LNS JOTVINGIS will not only be leading the eight SNMCMG1 vessels but also two more mine countermeasures vessels (one from the German Navy and the other from the Polish Navy) assigned to SNMCMG1 for the exercise. The exercise will train participating ships manoeuvring, convoy, at-sea detention, gunnery, defence against various types of targets, and asymmetric warfare, sea floor mine clearance, at-sea search and rescue, and other combat tasks. SNMCMG1 and ships assigned to it is a part of the NATO Response Force. The Group is deployed in the Baltic Sea to strengthen maritime security and reassure the region of NATO's solidarity and commitment to collective defence.